Halloween is gaining more and more momentum in Australia each year. Some schools and pre-schools may even plan Halloween parties or discos. Your child shouldn't have to miss out on the fun. Ask your child's teacher if you can bring in safe treats for the class or maybe ask if the 'treats' offered aren't even food! 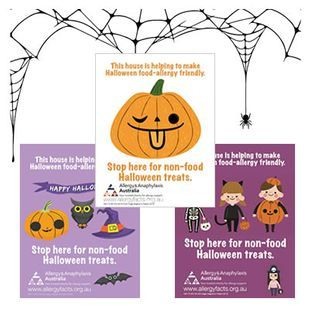 Raise awareness for food allergies and promote inclusion for all trick-or-treaters by offering non-food treats at your house and ask your neighbours to also. To be a safe house for those with allergies simply offer up non-food treats such as stickers, tattoos or other small items. 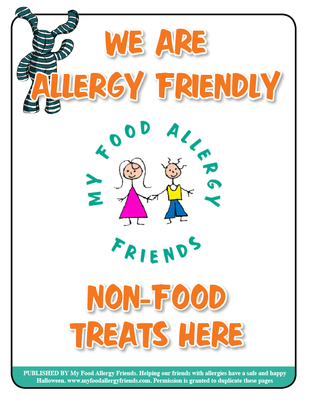 Download the Non-Food Treats Here sign from My Food Allergy Friends to display on your front door and mailbox. Pre-position safe candy at friends' houses. Carry safe snacks with you while trick-or-treating. Trade unsafe candy (or the entire bag) for allergen-safe treats, money or non-food items once your children return home. Other non-food ideas include colouring books, pencils, stickers, stuffed animals and small party favours. Check all ingredients. Remember that treat-sized candy may have different ingredients or be manufactured on different machinery than their full-sized counterparts. Be sure to carry your child's emergency medicines with you while trick-or-treating. Ensure your child understands they can't eat anything (or even touch) without checking with you first. Plan an alternative activity, such as going to the movies or a having a scavenger hunt for safe treats. Bake your own safe treats for Halloween like creepy looking foods! You can do some amazing things with fruit - search the internet for countless inspiration! Most of all remember to stay safe and have fun! Got a tip you would like to share? Please Contact Us so we can include it on this page to help other parents. Unless stated otherwise, advice offered on this page is from the Principal Author, who is non-medically qualified, however the medical content on this site has been reviewed for accuracy by our Medical Advisory Board.